In April 1989, 96 football fans died in a crush of overcrowded terraces at Hillsborough Stadium in Sheffield during a FA Cup semifinal match between Liverpool and Nottingham Forest. 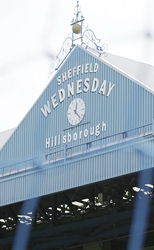 The worst sports disaster in English history and one of the deadliest football-related incidents anywhere ever, the Hillsborough disaster is many things beyond a horrible and unnecessary tragedy. It is a dark landmark in professional football in England, a predictable outcome of reactionary crackdowns after a wave of hooligan violence around the game during the preceding decade. It was a catalyst for drastic change in the upper echelons of the sport in the country of its inception, an important impetus behind the corporatization effort that lead to the formation of the Premier League in 1993. It became a core element of the supporter culture of Liverpool, whose fans suffered not only death and injury but the subsequent slander of a concerted, media-supported campaign to pin the awful consequences of police crowd mismanagement on the club’s (supposedly) drunken hooligan fans. It had a painful personal cost for the families of the dead, who lost loved ones and then suffered through two decades of protracted, agonizing struggle to hold the authorities responsible for their negligent failure to protect the public safety. Daniel Gordon’s ESPN 30 For 30 film Hillsborough, one of the few feature-length entries in the sports documentary series’ Soccer Stories imprint rolled out in advance of the 2014 World Cup, depicts all of these elements of the disaster with gravitas and detailed alacrity. But it also finds in Hillsborough the crumb trail of a euthanized society, a failed regime of public order in England in which the privileged power of institutional continuity consistently trumps individual rights and security. Hillsborough was a tragedy that only deepened due to a police cover-up that eventually reached to multiple institutional levels. This scrubbing-up effort encompassed same-day narrative shaping, investigations by police and the coroner in the immediate aftermath of the disaster that emphasized blood-alcohol levels and shifted responsibility onto the mob itself, alterations and falsifications of police statements that were critical of command decisions on match day, and long-lasting refusals by the national government to dig into the scandal around Hillsborough. Only recently, with a new independent inquiry in 2012, has the truth of the mix of institutional mismanagement and evidence alteration come to wider light in Britain. Director Gordon also made 9.79*, one of the stronger 30 For 30 films that also dealt with a system of corruption and backroom shadowplay. Hillsborough is grounded in much more sober stuff than blood doping in sprinting, however. Without a narrator, Gordon weaves together archival footage, specially-filmed geographical orientation material at the stadium, and gripping interviews with police officers, families of victims, and other figures close to the event to tell a powerful story. His narrator-proxy is Professor Phil Scraton, a criminologist whose eloquent, concise crusading for a re-evaluation of and new investigation into Hillsborough was vital to the formation of the independent panel of inquiry (on which Scraton served). This is a compelling documentary film for the football fan as well as for the sports neophyte. What is striking now about Hillsborough is how obvious it seems that something terrible like it would happen, and indeed that it took so long until it did. The disaster was a dark prologue of Thatcherite Britain, the inescapable conclusion of a broken society that, as the Iron Lady would have it, did not exist and ought not to. Crowd control and event policing in 1980s English football had become so obsessive about curtailing violence and isolating hooligans that it endangered mainstream spectators, which were always the vast majority. Combine the metal barricaded pens in the stands with distrustful, disdainful policing that assumes criminality and catastrophe is almost inevitable. Coming at the end of a long period of welfare state rollbacks and pitiless union-busting, Hillsborough was another blow to ordinary Britons by Thatcher’s Conservatives that, for all of its inadvertence, landed very painfully nonetheless.